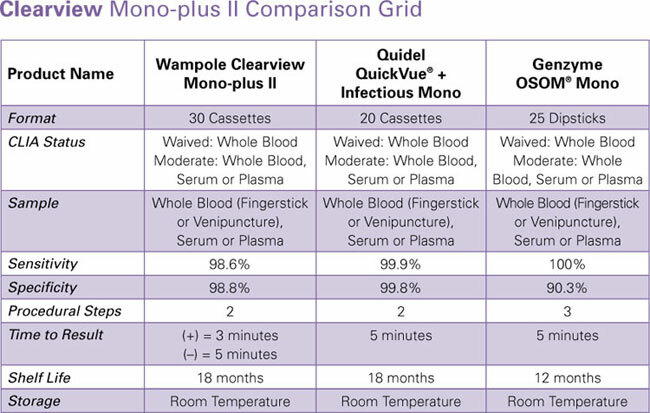 Two step technology provides quick, easy solution for diagnosing infectious Mononucleosis. For medical professional use only. This product cannot be purchased for personal or home use. specific tests for Infectious Mononucleosis (IM). Simplicity: CLIA waived,easy-to-use test requires no training. Reliability: Built-in control ensures accuracy. Immediate therapy reduces time of discomfort for patient. Minimizes the risk of more serious illness. Reduces the spread of virus to others.